Commercial products derived from the acai fruit (Euterpe oleracea Mart.) are available in Brazil, but in Venezuela, it is only known by ethnic indigenous groups of the Amazon. In this study, acai flour was made by solar dehydration and the effect of processing on the composition, microbiological quality, and antioxidant properties of such flour were evaluated. The fruit was purchased in Puerto Ayacucho, Venezuela, and a portion was manually pulped. Microbiological quality, proximal composition, minerals, polyphenols, tannins, anthocyanins, and antioxidant capacity were evaluated. The remaining portion of fruit was blanched in a solution of ascorbic acid and citric acid at 98ºC for 1min in the same manner, manually pulped, dried by solar dehydration and the acai flour was also analysed. From the composition of the acai flour, its high content of fat (22.9%), protein (13.7%), dietary fibre (20.5%), total polyphenols (1.60 g/kg) and antioxidant capacity (79.97%) stood out. The blanching of the fruit and the solar dehydrating of the acai pulp did not modify the composition, but they improved its microbiological quality and reduced phenolic compounds and antioxidant capacity. The flour obtained is stable and innocuous and could be used to diversify the diet of the indigenous people of the Amazon region. Key words: Acai, manaca, antioxidant capacity, Amazon, polyphenols, anthocyanins. Impacto de la deshidratacion solar en la composición y propiedades antioxidantes del acai (Euterpe oleracea Mart.). Los productos comerciales derivados del fruto del acai (Euterpe oleracea Mart) están disponibles en Brasil, no así en Venezuela donde sólo los grupos indígenas del Amazonas lo conocen y consumen. En este estudio se elaboró una harina de acai mediante deshidratación solar y se evaluó el efecto del procesamiento en la composición, calidad microbiológica y propiedades antioxidantes de dicha harina. Los frutos fueron adquiridos en Puerto Ayacucho, Venezuela y una porción de ellos se despulpó manualmente y se le determinó calidad microbiológica, composición proximal, contenido de minerales, contenido de polifenoles, taninos, antocianinas y la capacidad antioxidante. La otra porción del fruto se escaldó en una solución de ácido ascórbico y ácido cítrico a 98ºC por 1min, se despulpó manualmente y se eliminó su humedad por deshidratación solar; a la harina de acai obtenida se le hicieron los mismos análisis que a la pulpa. De la composición del acai resaltó su alto contenido de grasa (22.9%), proteína (13.7%), fibra dietética (20.5%), polifenoles totales (1.60 g/kg-1) y su capacidad antioxidante (79.97%). El lavado y escaldado de los frutos y la posterior deshidratación solar de la pulpa del acai no modificó significativamente su composición, pero si mejoró la calidad microbiológica y redujo los compuestos fenólicos y la capacidad antioxidante. La harina obtenida es estable e inocua y se podría utilizar para diversificar la dieta de los indígenas de la región del Amazonas. Palabras clave: Acai, manaca, capacidad antioxidante, Amazonas, polifenoles, antocianinas. Acai (Euterpe oleracea Mart. ), also known as assaí or manaca, is a palm tree widely distributed in the Amazon region. Its fruit is a round/oval berry, violet coloured when ripe (red variety), with a diameter of about 1-1.5 cm and weight of 1.5 g (1). In Brazil, the sowing and harvesting of acai is performed under controlled conditions (2,3) and products like frozen pulp, juices prepared by dilution of the pulp, acai wine, ice creams, acai-guarana pasteurised juice, etc., are commercialised (2,4,5). In Venezuela, however, the manaca, as the acai is generally known, is a wild fruit of the Amazon region, harvested between the months of July and December. The indigenous communities consume the acai fruit or prepare juices, but unlike in Brazil, products are not commercialised. In the acai composition, the high content of fibre, unsaturated lipids and minerals (6, 7) and antioxidant compounds such as total polyphenols, tannins and anthocyanins (8) are outstanding. The antioxidant properties of the Amazon plants and fruits are a topic of interest for several researchers (8-10). According to Lichtenthaler et al. (11), the products based on acai have a flavour similar to that of carrot and beetroot, a faint aroma, with palatability difficult to define and an oily appearance. Its high content of unsaturated fats and initial high microbial load make the acai fruit prone to deteriorate quickly, modifying its colour and flavour even under refrigeration (5,12,13). In Brazil (14), and in Venezuela (7), the dehydration of acai as an alternative to preserve the fruit and diversify its use has been investigated; it has also been added as ingredient in the formulation of new products. To prepare the flour, the fruit was not properly blanched prior to its dehydration in a drum dryer. With the flour, biscuits and cookies of proven acceptability by the indigenous people of two ethnic groups of the Amazon region were prepared, but strange odours developed during the storage of the products. Blanching fruits and vegetables prior to dehydration prevents spoilage reactions in flours obtained from them, caused by enzymes and microorganisms. The addition of antioxidant and chelating agents prevents the oxidation of the fat and preserves phenolic compounds. If an acidifying agent such as ascorbic acid is also used, the microbiological quality is improved and the colour, the phenolic compounds and the antioxidant capacity in the final product are preserved (15-17). The Amazon region is characterized for having high temperatures and high solar incidence and therefore, the use of a food dehydrator powered by solar energy is an alternative of interest for this area, mainly inhabited by indigenous people. Its use will allow obtaining flours from acai, as well as from other cultivated perishable products and therefore, the consumption of the autochthonous resources of the region transformed into stable flours would be increased, thus allowing the diversification of the diet of the indigenous people, and even its enrichment with nutrients very much required by the populations. The objective of this study was to obtain acai flour (Euterpe oleracea Mart.) by solar dehydration and to evaluate the effect of processing on the composition, antioxidant properties, and microbiological quality of such flour. The acai fruit (10 kg) was purchased at the local market of Puerto Ayacucho (Amazonas State). The fruit was washed with tap water, drained, and dried with absorbent paper to remove excess moisture. A portion of the fruit (2 kg) was manually pulped and kept in a plastic bag under refrigeration at 14°C until its subsequent analysis. The remaining fruit (8 kg) was subjected to blanching in an aqueous solution at 1% ascorbic acid and 0.6% of citric acid (15-17). In a preliminary study (18), and using the peroxidase test (19), the best blanching conditions were determined to be heating at 98ºC for 1min. The fruit was placed in the acid solution (citric and ascorbic mix) at 98ºC, at a 0.5 kg/L ratio; heating continued until the temperature of the solution reached 98ºC and maintained at this temperature for 1min. The blanched fruit was drained and submerged in an acid solution mix of equal concentration to the one used for the blanching, at 10ºC, drained and the excess moisture eliminated with absorbent paper. The blanched fruit was manually pulped, its moisture content was determined, and it was dehydrated using a solar dryer designed by Sanchez et al. (20), consisting of the following: a collector that captures solar energy to heat air, a drying chamber, an extractor to promote circulation of hot air, an opening for air inlet, and 3 metal mesh trays, the dimensions of which were 30 cm long and 20 cm wide. The pulp was uniformly distributed on the trays, forming a 0.5 mm thick layer. The initial weight of the pulp was recorded, and it was subjected to solar drying for a 7.5 h period. During drying, at 30 min intervals, the weight variation of each tray, room temperature, dry bulb and wet bulb on top and bottom part of the equipment, inlet, outlet and surface collector temperatures, the inner drying temperature and the airflow in the intermediate area of the equipment were registered. To measure the temperature, a thermocouple was used; for the airflow, a manometer was used. The dehydration process continued until a constant weight in the trays containing the pulp was achieved. The dehydrated pulp from the three trays was mixed, cooled until it reached room temperature and ground to 250 microns granulometry. The yield of the process was calculated. The dehydration was performed in triplicate and three samples were analysed. According to the 925.09 AOAC method (21). According to the 920.39 AOAC method (21), using technical grade hexane as extraction solvent. According to the 923.03 AOAC method (21). The 985.29 AOAC method was used (21). For the enzymatic hydrolysis, an enzymatic system formed by thermostable amylase, protease, and amyloglucosidase was used. The fractions of soluble and of insoluble dietary fibre were quantified and the total dietary fibre was calculated as the sum of the two fractions. According to the 984.27 AOAC method (21). From the ashes, an acid solution was prepared, and the following minerals were quantified: iron, copper, sodium, potassium, phosphorous, magnesium, manganese, zinc, chromium, and calcium. A Spectroflame XL ICP, (GBC, Australia), induced plasma spectrophotometer (ICP) was used. Total polyphenols, tannins, and anthocyanins were determined in the previously defatted flour with 180 microns granulometry. Total polyphenols were determined according to the method of Singleton and Rossi (22). For the calibration curve, an standard solution of tannic acid was used; the reading was made at a wavelength of λ= 765 nm, in a spectrometer Spectronic 21D (Milton Roy Company, Analytical Products Division New Cork, U.S.A). Total polyphenol content was quantified as the sum of the polyphenol content of each fraction analysed. For the determination of tannins, the colorimetric method of Price and Butler 1997 (23) was used. For the calibration curve, 25 mg of catechin were dissolved in 25 mL of methanol. The results were expressed as catechin equivalents/g of sample. For the determination of the anthocyanins, the spectrophotometric method (24) that quantifies total monomeric anthocyanins as cyanidin 3-glucoside by the differential pH method was used. Ten grams of the sample were taken in triplicate and placed in polyethylene bags with 90 mL of solution of peptone water at 0.1%; they were mixed and homogenised in a stomacher (LAB-BLENDER mod. 400, Seward Laboratory, London) for 30 s to obtain the dilution 10-1, from which the dilutions 10-2, 10-3, 10-4 y 10-5 were prepared. In the non-blanched pulp, aerobic mesophiles, total coliforms, faecal coliforms, Staphylococcus aureus, moulds, and yeasts were determined. In the flour, the presence of aerobic and anaerobic sporeforming microorganisms was also determined. From the dilutions 10-3 and 10-5 pour plate count was performed in standard plate count agar. The incubation was carried out at 37ºC for 24-48 h (26). From dilutions 10-1, 10-2, 10-3 and using lauryl sulphate tryptose broth (LSTB), and with the technique of the most probable number (MPN), a presumptive count of total coliforms was performed. The tubes were incubated at 37ºC for 24-48 h. The presence of turbidity and gas was considered as positive (26). In the positive tubes of LBGBB, the presence of faecal coliforms was determined. Escherichia coli broth (EC) was used, and the tubes were incubated at 45ºC for 24 h; they were considered positive by the presence of turbidity and gas (26). From the dilutions 10-3 and 10-5, pour plate count in potatodextrose agar (PDA) was performed. The incubation was carried out for 5-7 days at 25ºC (26). From dilutions 10-2 and 10-3, the surface plating was made on Baird Parker agar, BP (Difco brand), with added egg yolk emulsion at 40% and potassium tellurite at 3.5%. The plates were incubated at 37ºC for 24-48 h, and the presumptive colonies, brilliant black in colour with a precipitation halo around them, were counted (26). The sample was homogenised in peptone water at 0.1% for 30 s and heated at 94ºC for 20 min and the presence of bacillus spores was detected. One mL of dilutions 10-2 and 10-3 was taken and plated in dextrose tryptone agar and incubated at 37ºC for 24-48 h. For Clostridium-type spores, 1 mL of dilutions 10-2 and 10-3 was taken and plated in Millet-Pricklet tubes containing “reinforced clostridium” media (RCM), which were incubated in anaerobic conditions at 37ºC for 24-48 h (26). The results were reported as mean and standard deviation of triplicates. A t-student test was applied to evaluate the effect of blanching and dehydration of the pulp on the parameters studied. The statistical software SPSS version 12.0 was used, with the value P <0.05. On Table 1, the proximal compositions of the acai pulp and of the flour are presented, expressed on dry basis for comparative purposes. No significant differences in the content of proteins, fat and dietary fibre of the pulp and of the flour were observed (P <0.05); the high protein content of both is outstanding (14.5 and 13.7 g/100 g, respectively), which agrees with that reported by other authors (3,10). The fat content (24.0 and 22.9 g/100 g, respectively) is higher than what has been reported (3,10). A significant decrease in the content of ash and of minerals like zinc, iron, potassium, calcium, and phosphorous of the flour respect to the pulp was observed. Means and standard deviations of triplicates are reported. Equal letters on the same row indicate no significant differences (P<0.05). Carbohydrates are calculated by difference. Moisture of pulp was 45 and of flour 8 g/100g. 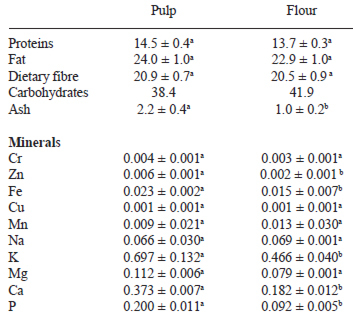 On Table 2, the microbiological quality of the acai pulp and of the flour is shown. In the pulp, the count of all the microorganisms investigated was high and in some of them, uncountable; the presence of S. aureus was negative. The highest microbial load of the pulp was of moulds and yeasts, followed by total and faecal coliforms. The presence of latest microorganisms indicates that the microbiological quality of the pulp must be questioned (27). The antioxidant compounds of the polyphenolic type, tannins, anthocyanins and antioxidant capacity of the pulp and of the flour are shown on Table 3. The contents of polyphenols and tannins of the pulp were significant greater than that of the contents of polyphenols and tannins present of the flour obtained by the sundrying process. However, no significant difference was observed between the content of anthocyanins of the pulp and of the flour. The correlation between polyphenols, tannins and anthocyanins and the percentage of inhibition by DPPH was calculated and shown in Fig. 1; for the polyphenols, the value of r2 was 0.7217 (Fig 1a), for the tannins, it was 0.6803 (Fig. 1b), and for the anthocyanins, it was 0.9061 (Fig.1c). The protein content of the acai pulp agrees with that reported by previous authors, but the fat content of both materials is higher than what has been reported (3,10). According to published results (8,10), polyunsaturated fatty acids predominate and represent 71% of the total lipids. Regarding the changes in mineral content of the flour, it is possible that the immersion of the acai in the ascorbic and citric acid solution used during blanching promoted the loss or solubilisation of some minerals. Amaro et al. (28) reported a significant reduction of iron and other minerals in asparagus after washing and blanching. It is important to bear in mind that the acai fruit is wild and their collection from the plant, and from the ground, is manual; later, it is taken to the local markets for its sale, without refrigeration, which justifies the high count of microorganisms. Microbiological deterioration, like the chemical one, is related to the pulp composition. High content of moisture, proteins, and unsaturated fats, together with a high count of moulds, yeasts and coliforms are responsible for the short useful life acai pulp and if it is used to prepare other products where heat is not applied, these will deteriorate rapidly (7). When the pulp was transformed into flour, the count of the microorganisms investigated decreased, and in some cases was zero. The presence of aerobic and anaerobic spore-forming microorganisms (Bacillus and Clostridium, respectively) was investigated because the acai fruit may have been in contact with the soil and the flour was later obtained by applying heat, but, fortunately, the presence of these microorganisms was negative. Moulds and yeasts count of flours must be less than 104 CFU g-1; aerobic mesophiles, between 102-106 CFU g-1; coliforms less than 10 CFU g-1, and spores less than 100 CFU g-1 (27). The acai flour obtained by solar dehydration fulfils the established standards. Washing of the fruit, blanching in an acid medium, thermal treatment applied during blanching, added to that of solar dehydration and the low moisture content of the flour turned to be effective factors to inactivate or inhibit the growth of the microorganisms initially present in the pulp. The acai flour is a stable and innocuous product. The results indicate an obvious degradation of the total polyphenols, including tannins, as the effect of solar drying, but this change was not observed for anthocyanins. This result was not as expected because according to some authors, anthocyanins are highly thermolabile, especially the type cyanidin-3-rutinoside, which have been found in acai by other authors . For a better explanation of the results, the use of HPLC is required to differentiate the types of anthocyanins present in the acai fruit and observe their behaviour under the solar drying treatment. Decrease of the total polyphenols lowered the antioxidant capacity of the flour, but nonetheless, the values are high (88.03 and 79.97%, respectively). These results are comparable to the ones reported for prepared acai juices, with a pulp:water concentration ratio of 1:3 and 1:5 was 79.3 and 71.8%, respectively (30), while for commercial mixes of acai and guarana juices, it was 58% (30). Several authors (1,11,30-32) reported that the polyphenol type predominant in the manaca is the anthocyanins, structurally derived from condensed tannins, and that some of those anthocyanins can become unstable in an acid medium. Certainly, blanching, addition of ascorbic acid, and solar dehydration are alternatives to stabilize acai fruit but they may decrease antioxidant capacity. Other authors (10,11,33) have calculated and discussed the correlation between polyphenols and other flavonoid compounds with the antioxidant capacity of several vegetables. According to Anagnostopoulou et al. (34), the correlation between polyphenols of the extract of sweet oranges (Citrus sinensis) and the antioxidant capacity measured with DPPH gave r2=0.4253, while Park et al. (29) reported a lineal (r2=0.9951) and significant correlation between the antioxidant capacity and the phenolic compounds in dehydrated Manilkra sapota. This analysis suggest inferring that anthocyanins and tannins are the main polyphenols responsible for the antioxidant capacity of the acai flour, due to the highest correlation presented in this study. Acai or manaca, fruit of the Amazon with nutritional and antioxidant properties but with a high microbial load can be transformed by a technology accessible to etnic groups of the area into stable and safety flour that can be used as ingredient for prepare dishes and beverages. Therefore, diversification of diet of etnics groups of the area would be achieved and they could take full advantage of the acai properties, not only the nutritional ones, but also as a functional food. Del Pozo-Insfran D, Brenes CH, Talcott ST. Phytochemical composition and pigment stability of Acaí (Euterpe oleracea Mart). J Agric Food Chem 2004; 52(6): 1539-1545. Padhila de Oliveira MS, Urano de Carvalho JE, Oliveira do Nacimiento WM, Müller CH. Cultivo do Açaizero para produçao de frutos. Circular Técnica, Ministerio de Agricultura, Pecuaria e Abastecimiento (EMBRAPA). Belém 2002. Bovi MLA, Castro A. Assai In: Clay JW, Clement CR. (Ed.). Income generating forests and conservation in Amazonia. Rome, FAO 1993; pp 58-67. Pereira E, De Queiroz AJ, De Figuereido R. Massa específica de polpa de acaí em funçao do teor de sólidos totais e da temperatura. Rev Brasilera Engenharia Agrícol Ambient . 2002; 6(3): 526-530. Alexandre D, Cunha RL, Hubinger MD. Conservação do açaí pela tecnologia de obstáculos. Ciênc Tecnol Aliment 2004; 24(1): 114-119. Franco G. Tabela de composiçao química de alimentos. Ed. Atheneu, Río de Janeiro, 1992; pp 307. Sangronis E, Teixeira P, Otero M, Guerra M, Hidalgo G. Manaca, batata y ñame: posibles sustitutos del trigo en alimentos para dos etnias del amazonas venezolano. Arch Latinoamer Nutr 2006; 56(1): 73-82. Sanabria N, Sangronis E. Caracterización del acaí o manaca (Euterpe oleracea Mart. ): un fruto del Amazonas. Arch Latinoamer Nutr 2007; 57(1): 94-98. Del Pozo-Insfran D, Percival SS, Talcott ST. Acai (Euterpe oleracea Mart) polyphenolics in their glycoside and aglycone forms induce apoptosis of HL-60 leukemia cells. J Food Agric Food Chem 2006; 54(4): 1222-1229. Silva EM, Souza JNS, Rogez H, Rees JF, Larondelle Y. Antioxidant activities and polyphenolic contents of fifteen selected plant species from the Amazonian region. Food Chem 2007; 101: 1012–1018. Lichtenthaler R, Rodrigues RB, Maia JG, Papagiannopoulos M, Fabricius H, Marx F. Total oxidant scavenging capacities of Euterpe oleracea Mart (Açai) fruits. Int J Food Sci Nutr 2005; 56(1):53-64. Larondellé Y. Etude pluridisciplinaire de la transformation de fruits amazoniens en vue de leur valorisation commerciale par les organisations paysannes existantes. In: Fruitss amazoniens/Transformation/Commercialization. Tropical and subtropical agriculture, third std programme, 1992-1995. Published by CTA 1999. Université catholique de Luovain. http://www.cta.int/pubs/std.vol2/pdf/300.pdf. [accessed 23 november 2004]. Bueno SM, Lopes MR, Graciano RA, Fernández EC, García-Cruz CH. Avaliaçao da qualidade de polpas de frutas congeladas. Rev Inst Adolfo Lutz 2002; 61(2):121-126. Melo CF, Barbosa WC. Obtainment of dehydrated acai. Boletim de Pesquisa Centro de Pesquisa Agropecuaria do Tropico Umido. 1998; EMBRAPA-CPATU. Belem PA, Brazil. Burnham JA, Kendall PA, Sofos JN. Ascorbic acid enhances destruction of Escherichia coli O157:H7 during home-type drying of apple slices. J Food Prot 2001; 64:1244-1248. Derrickson-Tharrington E, Kendall PA, Sofos JN. Inactivation of Escherichia Coli O157:H7 during storage or drying of apple slices pretreated with acidic solutions. Intern J Food Microb 2005; 99:79-89. Rababah TM, Ereifej KI, Howard L. Effect of ascorbic acid and dehydration on concentrations of total phenolics antioxidant capacity, anthocyanins and color in fruitss. J Agric Food Chem 2005; 53: 4444-4447. Sanabria N. Caracterización de la harina de manaca (Euterpe oleracea Mart) obtenida por deshidratación solar. Trabajo de grado para optar al titulo de MsC en Ciencia de los Alimentos. Universidad Simón Bolívar, Caracas, Venezuela; 2006. Savas BK, Serpen A, Gökmen V,Acar J. Study of lipoxigenase and peroxidase as indicator enzymes in green beans: change of enzyme activity, ascorbic acid and chlorophylls during frozen storage. J Food Eng 2005; 66:187-192. Sánchez A, Paradas NR, Sandoval A. Design and evaluation of a solar dryer. X Latin American Congress on Materials and Heat Transfer. 2005; (CD. ISBN: 980-237-230-7) Caracas, Venezuela. AOAC. Official Methods of Analysis 15th. Ed. Association of Official Analytical Chemists, Washington, DC. 1990, Vol. I, pp. 684; Vol. II, pp. 605. Singleton VL, Rossi JA. Colorimetry of total phenolics with phosphomolybdic-phosohotungstic acid reagents. Am J Enol Viticult 1965; 16:144-158. Price M, Butler L. Rapid visual estimation and spectrophotometric determination of tannin content of sorghum grain. J Agric Food Chem . 1977; 25(6): 1268-1273. Wrolstad RE, Durst W, Lee J. Tracking color and pigment changes in anthocyanin products. Trends Food Sci Tecnol 2005; 16: 423-428. Wang W, Jiangang L, Rangarajan M, Chao Y, LaVoie J, Huang T, Ho Ch. Antioxidative phenolics compounds from Sage (Salvia officinalis). J Agric Food Chem 1998; 46: 4869-4873. APHA. American Public Health Association Compendium of methods for microbiological examination of foods. 2nd edition compiled by APHA Technical Committee on Microbiological Methods for foods. Editor M. Speck. Washington, DC. 1984. ICMSF. International Commission on Microbiological Specifications for Foods. Microbial ecology of foods (2): Food commodities. Academic Press, Inc. Florida, USA. 1980. pp 694. Amaro MA, Moreno R, Zurera G, Sánchez PJ. Nutritional changes in the essential trace elements content of asparagus during industrial processing. Food Res Int 1999; 32: 479-486. Park Y, Jung S, Kang S, Delgado-Licon E, Martinez Ayala AL, Tapia MS, Martín-Belloso O, Trakhtenberg S, Gorinstein S. Drying of persimmons (Diospyros kaki L.) and the following changes in the studied bioactive compounds and the total radical scavenging activities. Lebens-Wiss U-Technol. 2005; 39(7): 748-755. Martelli M. Caratterizzazione chimica parziale di alcuni prodotti derivati da euterpe olerace, potenzialmente utilizzabili come nutraceuti nonche come derivati base per la strutturazione di prodotti dietetici innovativi o alimenti funzionali. Dipartimento di Scienze Chimiche Alimentari Farmaccutiche e Farmacologiche DISCAFF. 2004. http://www.soulfoodsrl.it/pdf/analisinovara.pdf. [accessed 16 March 2005]. Bobbio FO, Druzian JI, Abrao PA, Bobbio PA, Fadelli S. Identificaçao e quantificaçao das antocianinas do fruto do açaizeiro (Euterpe oleracea Mart). Cienc Tecnol Aliment 2000; 20 (3): 388-390. Gallori S, Bilia AR, Bergonzi MC, Barbosa WRL, Vincieri FF. Polyphenolic Constituents of Fruits Pulp of Euterpe oleracea Mart. (Açai palm). Chromatog 2004; 59 (11/12): 739-743. Liu X, Ardo S, Bunning M, Parry J, Zhou K, Stushnoff C, Stoniker F, Yu L, Kendall P. Total phenolic content and DPPH radical scavenging activity of lettuce (Lactuca sativa L.) grown in Colorado. LWT 2007; 40: 552-557. Anagnostopoulou MA, Kefalas O, Papageorgiou VP, Assimopoulou AN, Boskou D. Radical scavenging activity of various extracts and fractions of sweet orange peel (Citrus sinensis). Food Chem 2006; 94: 19-25.